Removing the manure from the bans is important for the stalls and paddocks to be kept clean. 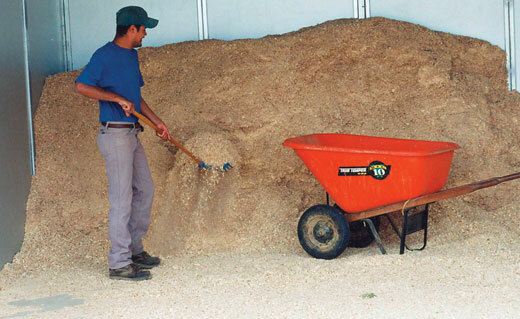 Scattered hay and wasted grain about the barn or in the yard can be fly breeding spots if wet and thus should be collected and stored at a designated area. The storage space will hold the manure which can be lead to composting by the owner or to be hauled away to composting facilities. The site should be convenient for easy loading and unloading. The storage area should be at an elevation to avoid water runoff from surface to streams or other surface water. Composting is a major approach to waste management. It is not an expensive method and is very efficient for managing large amounts of manure. The organic materials are converted to humus in an aerobic process whereby microorganisms like bacteria and fungi are involved. During composting the there should adequate amount of moisture and oxygen while the carbon nitrogen ratio of the material being composted must be in the optimal ratio between 25:1 and 30:1. The waste should be piled t three to four feet high and grass urea or other high nitrogen containing material can be added to the pile if it doesn’t get hot enough. The moisture content of the pile should be maintained by constant watering. Also there should be turning of the compost to ensure uniform decompositio0n of all the waste. Compost systems can be designed for any size of farm. Windrows are long free standing piles used for large farms while in small farms a three bin system can be utilized. Although it is not a cheap management method it is an easy one whereby the waste is trucked to commercial facilities that compost manure either at a charge for drop-off or for free. These waste management methods are easy to undertake in a farm despite the number of horses.